The International Monetary Fund says its managing director Christine Lagarde is deferring her trip to the Middle East. A brief statement by an unnamed IMF spokesman Wednesday did not elaborate. Lagarde had said earlier during the IMF and World Bank’s annual meeting in Bali, Indonesia, last week that she was “horrified” by the disappearance of Saudi journalist Jamal Khashoggi but still intended to attend an investment conference in Saudi Arabia later in the month. Turkish officials have said there’s evidence the U.S.-based writer for The Washington Post was killed and dismembered at the Saudi consulate in Istanbul. Foreign ministers from the G-7 group of industrialized nations say they are very troubled by the disappearance of Saudi journalist Jamal Khashoggi and say those responsible must be held to account. The statement from Canada, France, Germany, Italy, Japan, United Kingdom and United States as well as the European Union affirms their commitment to defending freedom of expression and protection of a free press. The statement issued Tuesday says they encourage Turkish-Saudi collaboration and look forward to the Kingdom of Saudi Arabia conducting a thorough, credible, transparent and prompt investigation. U.S. Secretary of State Mike Pompeo says Saudi Arabia has made a “serious commitment” to hold senior leaders and officials accountable in the case of missing journalist Jamal Khashoggi. 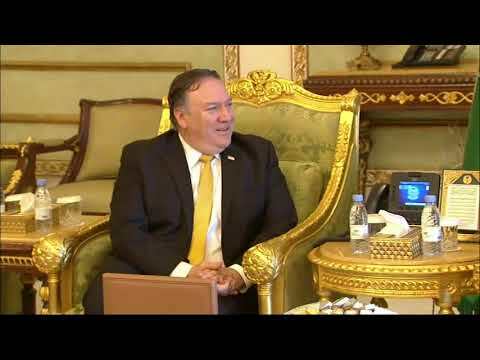 Pompeo was in Saudi Arabia for meetings with Saudi Crown Prince Mohammed bin Salman. He offered his assessment after talks with the Saudi leadership and said the crown prince again denied any knowledge of what happened to Khashoggi at the Saudi consulate in Istanbul. Turkish officials say there is evidence that the U.S.-based writer for The Washington Post was killed and dismembered at the consulate. Saudi Arabia has called the allegations “baseless.” Pompeo’s statement said the Saudis acknowledged that something had happened to Khashoggi but were not specific. Attorney General Jeff Sessions says “serious evaluation” is being given over whether U.S. law enforcement officials will aid in the investigation of the disappearance of Saudi journalist Jamal Khashoggi. But Sessions said at an unrelated news conference on Tuesday that he would not comment further on the matter. Sessions also declined to say whether he had any concerns over the current investigation. President Donald Trump said Saudi Arabia’s crown prince denied knowledge of what happened to Khashoggi, who went missing after visiting the Saudi Consulate in Istanbul. Khashoggi had written columns for the Washington Post that were critical of the crown prince. Sessions said there is “an unacceptable trend” of journalists being killed across the world. Iraq’s populist cleric Muqtada al-Sadr is accusing President Donald Trump of feigning concern over the disappearance of Saudi journalist Jamal Khashoggi while ignoring other forms of injustice. Al-Sadr called Trump a “Pharaoh” and “tyrant” who speaks out about injustice when it suits him. The message, published by his office Tuesday, appeared critical of Saudi Arabia as well, at a time when Iraq’s politicians are finding themselves courted by the Gulf state and its rival, Iran. Iraq is in the process of forming a new government after national elections last May. Al-Sadr incorrectly identified Khashoggi as a U.S. national. He is Saudi journalist who was living in self-imposed exile in the United States, where he wrote opinion columns in the Washington Post that were critical of Saudi policies. He went missing during a visit to the Saudi Consulate in Istanbul on Oct. 2. The U.N. special investigator on torture says if Turkey and Saudi Arabia can’t conduct “a credible and objective investigation” into the disappearance of Saudi journalist Jamal Khashoggi then there may be a need for international involvement. Modvig said the committee follows up on recommendations but he couldn’t say whether it would look into the Khashoggi case. Turkey’s ruling party says a “whitewash” of the investigation into the disappearance of Saudi journalist Jamal Khashoggi is out of the question. A high-level Turkish official told the Associated Press earlier Tuesday that Turkish police have found “certain evidence” showing that the journalist was killed inside the consulate. The official said the evidence was recovered during the hourslong search of the diplomatic mission that ended early Tuesday. Turkey’s state-run news agency says the Saudi consul to Istanbul has left for Saudi Arabia, hours after Turkey said his official residence would be searched in connection with a Saudi writer’s disappearance. Saudi Arabia previously called the allegation “baseless,” but U.S. media reports suggest the Saudis may acknowledge Khashoggi was killed there, perhaps as part of a botched interrogation. U.S. Sen. Lindsey Graham says he believes Saudi Crown Prince Mohammed bin Salman had a U.S.-based journalist “murdered” in the Saudi consulate in Turkey and has “tainted” his country as a result. The influential Republican and ally of President Donald Trump says the crown prince “has got to go.” Graham says he will not return to Saudi Arabia while the prince is in power. The senator spoke Tuesday on “Fox & Friends.” He cited published reports that Prince Mohammed had approved an interrogation or rendition of Khashoggi back to Saudi Arabia, and that an intelligence official who was a friend of the crown prince had killed the journalist. The minister also confirmed that Turkish authorities would search the Saudi consul’s residence in Istanbul and vehicles belonging to the consulate. He offered no timeframe for those searches. The meeting came two weeks after the disappearance of Khashoggi, who went into a self-imposed exile in the United States amid Prince Mohammed’s rise. Turkish officials fear Saudi officials killed and dismembered the writer at the Saudi Consulate in Istanbul. Saudi Arabia previously called the allegation “baseless,” but reports suggest they may acknowledge Khashoggi was killed there. France’s foreign minister is warning of possible “consequences” for the disappearance and suspected slaying of Saudi writer Jamal Khashoggi. The U.N. human rights office is calling for the immediate and “absolute” lifting of diplomatic immunity enjoyed by any officials or premises in the investigation into the disappearance and suspected slaying of Saudi writer Jamal Khashoggi. Turkish media are quoting President Recep Tayyip Erdogan as saying police investigators have searched for traces of “toxic materials” at the Saudi Consulate in Istanbul where Saudi journalist Jamal Khashoggi disappeared two weeks ago. Turkish officials believe Khashoggi was killed and dismembered inside the consulate. Saudi Arabia previously called the allegation “baseless,” but reports suggest they may acknowledge Khashoggi was killed there. Turkish forensic investigators searched the consulate overnight. A Turkish official said on Tuesday the top Saudi diplomat’s residence in Istanbul would also be searched. State-run Anadolu Agency quoted Erdogan as saying Turkey wished a “result that allows us to reach an opinion” as to what happened to the journalist. A Turkish Foreign Ministry official says Turkish authorities will search the residence of the top Saudi diplomat in Istanbul over missing journalist Jamal Khashoggi’s disappearance. The official did not say when the search of the consul’s home would take place. The official spoke on Tuesday on condition of anonymity in line with government regulations. Khashoggi disappeared two weeks ago on a visit to the consulate. Turkish officials fear Saudi officials killed and dismembered the writer inside the mission. Saudi Arabia previously called the allegation “baseless,” but reports suggest they may acknowledge Khashoggi was killed there. Surveillance footage leaked in Turkish media shows vehicles moving between the consulate and the consul’s home after Khashoggi’s disappearance. Khashoggi disappeared two weeks ago at the Saudi Consulate in Istanbul. Turkey fears Khashoggi was killed and dismembered at the consulate. Saudi Arabia previously called the allegation “baseless,” but reports suggest the kingdom may soon acknowledge the writer was killed there. The United Nations’ high commissioner for human rights is urging Saudi Arabia and Turkey to “reveal everything they know about the disappearance and possible extrajudicial killing” of Saudi writer Jamal Khashoggi. Michelle Bachelet made the comment on Tuesday as U.S. Secretary of State Mike Pompeo arrived in Saudi Arabia to talk to King Salman about Khashoggi’s disappearance. Turkish officials say they fear Khashoggi was killed and dismembered inside the consulate. Saudi officials previously have called the allegations “baseless,” but reports in U.S. media on Tuesday suggested the kingdom may acknowledge the writer was killed there. Khashoggi vanished on a visit to the consulate two weeks ago. Turkish officials fear he was killed and dismembered. Saudi Arabia has called those allegations “baseless,” but has been unable to explain what happened to him.